Welcome to the fabulous capital of Norway - Oslo! Your private driver meets you at the airport and transfers you to your centrally located hotel for check-in. Optional pre-tour extension: Extend your Scandinavian journey to Copenhagen, one of the most charming, healthiest and colorful capitals in Europe. Recommended dinner: As the grand final of the first day we advise you to dine at the famous panoramic restaurant 34 Sky Bar. After breakfast you meet your guide at the hotel lobby and go on a 5-hour guided city tour of the magnificent Norwegian capital. For your convenience we have booked a 24 hour Oslo pass which gives you an opportunity of free entry to 30 museums and attractions, free travel on all public transport and many other advantages. Recommended activity: Oslo is famous as Europe's Outdoor Capital that offers a variety of outdoor activities for any taste and budget, including cycling, hiking, kayaking and sailing. Following breakfast you check out from your hotel and walk to the train station (easily accessible by foot), where you board a train that takes you to an unforgettable Oslo - Myrdal - Flam rail ride. This trip is a perfect chance to admire the mind-boggling nature and picture-postcard scenery of Norway. The duration of your trip is about 6 hours. Upon arrival you walk to your hotel to take some rest and relax. In the evening we invite you to visit a local Ægir Brewery & Pub to enjoy a traditional Ægir Viking plank. This is a special 5-course food tasting served with 5 different Ægir beers (included in the price). You have the chance to taste the Norwegian delicacies, including shellfish, smoked reindeer, fish and shellfish soup, pork shank and dark Porter chocolate cake (the menu might vary slightly depending on the season). If you want to continue this gastronomical evening you can dine at the Flamstova Restaurant that offers a rich menu of traditional Scandinavian cuisine. Dinner is optional and should be booked separately. *If accommodation in Flam is completely sold out alternative accommodation in Aurland or Gudvangen will be provided. Breakfast and beer tasting included. This is a sea kayak tour and short hike combined, the ideal way to experience the Fjords of Norway. You paddle to Fronneset, a place of historical importance from the viking era. Embark on a fascinating cycling journey through one of the most scenic paths in Norway - Rallarvegen. Upon arrival you walk to your hotel located very close to the boat station and have the rest of the day free to explore the city by yourself and enjoy its unique atmosphere. In the evening you are invited to enjoy traditional Norwegian 4-course dinner at your hotel. Breakfast and dinner are included. After breakfast you check out from your hotel and meet your driver-guide who takes you on an unforgettable journey to one of the world's most famous glaciers - Briksdal Glacier. Surrounded by the roaring waterfalls, fertile valleys and mighty mountains it offers one of the most awe-inspiring natural scenery in Norway! You spend around two hours exploring the magnificent beauty of Briksdal Glacier. During the tour you also enjoy buffet lunch at the local restaurant and have a few photo stops along the scenic drive, so make sure to take a lot of pictures to share with your friends and family later on. Please note: Briksdal Glacier tour is available only from May to September. After the tour you are transferred to the spectacular Geiranger village located nearby the UNESCO-listed Geirangerfjord that is one of the most visited tourist attractions in Norway. 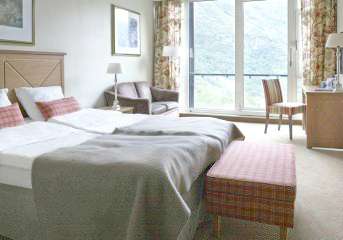 Upon arrival you check-in to your remarkable hotel providing magnificent fjord views. Following breakfast you have the morning free to relax in the Union Bad swimming pool of your hotel or explore the charming village of Geiranger on your own. This 2-hour sightseeing tour will take you to the famous viewpoint of Mt. Dalsnibba in Geiranger that offers excellent photo opportunities. In the afternoon you check out from your hotel and your driver transfers you to the port where you board a comfortable Hurtigruten ship to enjoy a fantastic cruise to Alesund that provides you with the unique chance to admire spectacular Norwegian sceneries and mind-boggling fjords. The duration of your trip is about 5 hours. After breakfast you meet your private guide and enjoy a wonderful 3-hour walking tour. After the tour you return to your hotel and have the rest of the day free. You can join one of the optional tours or continue exploring this beautiful city by yourself. Recommended activity: Visit the Alesund Museum and the Fisheries Museum. Following breakfast you check out from your hotel and your driver transfers you to the airport for your flight to Bergen - the second largest city in Norway (flight tickets are included). The duration of your flight is about 1 hour. Upon arrival your driver transfers you to your centrally located hotel to leave your luggage. You then have a 3-hour guided walking tour around the most interesting sights of Bergen. During the tour you also enjoy a fantastic Floibanen funicular ride that is one of Norway's best-known attractions. Optional extension of the city tour: Visit to the Grieg Museum at Troldhaugen - the former home of Norwegian composer Edvard Grieg. The rest of the day is free for you to do some independent sightseeing, dine in one of the local restaurants or just take a leisurely walk around the city. This is the last day of your amazing Norwegian adventure! After breakfast you check out from your hotel and have some free time to continue exploring Bergen on your own or join one of the optional tours. You are then transferred to the airport in Bergen for your flight back home. We wish you a safe flight and hope to work on your future trips! Optional departure: If you wish to depart home from Oslo you may take a quick Bergen - Oslo flight or travel to the capital of Norway by train (flight and train tickets to Oslo are available on request). Optional post-tour extension: Enjoy the untouched nature, breathtaking landscapes, and vibrant culture of Iceland's most significant places including Reykjavik and the nearby area. Scandinavian climate is unpredictable and weather can be quite harsh even during summers. Bringing a water-resistant jacket, umbrella, and some warm clothes is a must. Most of the tours you’re going to have are walking, so make sure to bring convenient walking shoes. Tips to guides and drivers in Scandinavia are not required or expected. However, if you really enjoyed the service, a symbolic tip of no more than $10 will be appreciated.